Fforest Fawr UNESCO Global Geopark01639 730395work Country ParkThe Fforest Fawr UNESCO Global Geopark is located in South Wales, UK, in the west of the Brecon Beacons National Park. It bridges the transition from rural mid-Wales to the industrial valleys of south Wales. Nearly 11,000 years of human activity in the area of the Fforest Fawr UNESCO Global Geopark created a cultural landscape in which ancient monuments contrast with the legacy of 200 years of industrial activity. Quarries, limekilns, tramroads, canals, coal and silica mines reflect a period in which the Geopark’s geological resources were exploited for metal production in south Wales. Weathered and overgrown, these relics of an industrial age are an integral part of the Geopark’s beautiful and dramatic landscape. The rich culture of the Geopark’s early inhabitants comes to life in myths and legends linked to wooded valleys, caves, lakes and misty mountain tops. The UNESCO Global Geopark provides recreational opportunities throughout the year. Visitors can obtain information, purchase maps and guides to walks and geotrails from six centres, situated mainly in local communities and enjoy a friendly reception. The area incorporates some of the most stunning natural and man-made attractions in Wales, including the breathtaking Carreg Cennen Castle, The National Showcaves Centre for Wales, Craig-y-nos Country Park, the wilderness area of the Black Mountain, Pen y Fan (the highest mountain in southern Britain), The Brecon Mountain Railway and the National Park’s reservoirs, rivers and waterfalls. The Geopark is also about people. People have been making use of rocks here for thousands of years - from the mysterious standing stones of our distant ancestors to Iron Age hill forts and from Roman roads to Norman Castles. The archaeological, industrial and agricultural monuments are an integral part of the Geopark's landscape and both man and wildlife have lived alongside each other in the Geopark for more than 7,000 years. The plants and animals, occupying the diverse habitats provided by watersides and woodland, moorland, scree and crag are also part of the Geopark story. The coming of the Industrial Revolution led man to exploit the coal, silica rock, rottenstone and limestone found in the Geopark. The presence of quarries, mines and limekilns together with canals, tramways and railways for transporting these resources, bears witness to industrial activity on a large scale. The mineral riches of the Geopark area played a vital role in the early industrial development of South Wales, a region whose manufacturing ouput led to the world. Hill farms, fileds bounded by dry stone walls and pillow mounds for breeding rabbits are evidence of flourishing agricultural activity. Towns and villages expanded with a growing population. The wild mountains and hidden valleys of the Geopark are the result of nearly 500 million years of earth history. This special area contains evidence of ancient seas, mountain building and sea level and climate change scattered across a landscape that was shaped by the last ice age. There are famous waterfalls, amazing caves and the highest land-mass in southern Britain. The rocks and landscapes of Fforest Fawr Geopark record significant events in the Earth's history and help us to understand the geological evolution of Wales, the British Isles and Europe. Here you will find evidence of ancient seas which came and went, and of mountains that were raised up as continents collided. 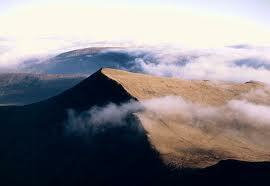 The Fforest Fawr UNESCO Global Geopark is located in South Wales, UK, in the west of the Brecon Beacons National Park. It bridges the transition from rural mid-Wales to the industrial valleys of south Wales. The landscape was carved into the shape seen today during the Ice Ages, from 2 million to 12,000 years ago. Glaciers were carved out the valleys of the Usk, Neath, Tawe and Cennen and rocks which were gouged out by the glaciers were deposited along the sides and bottoms of valleys, or randomly scattered across the upland landscape. Snow and ice collected on north facing slopes, developed into glaciers and gouged away the rock leaving the landscape largely as seen today.Climate change is also a constant theme, most dramatically recorded in the legacy of ice sheets and glaciers which shaped this landscape in the last two million years. The Fforest Fawr Geopark is set in 300 square miles / 763 km2 in the the western half of the Brecon Beacons National Park. By Car: The A40 runs from Abergavenny to Brecon, then along the northern edge of the Geopark to Llandovery and Llandeilo. The A465 'Heads of the Valleys Road' runs along the southern edge of the Geopark from Merthyr Tydfil to the Vale of Neath. The western part of the Geopark is reached from the end of the M4 within 30 minutes.